Cooking, Journal, They can't all be winners. Before I tell you my dumb tale, can I ask for prayers for my mom? Her immune system is very weak and the chicken pox virus is activated in her system again. My dad’s e-mail said: Her immune system is so poor that that virus broke out again. After a couple of hours in the ER, she was taken to her room. It’s isolation, meaning people coming in wear masks and gowns—so no visitors. She reminded me that it’s preventive care. She will be given two anti-biotics and one anti-viral—IV. I have no idea how they will keep her. She had one pox and some other bumps. So a prayer would be very appreciated. Thanks, guys. On to my dumb story: Beth, the pretzel light sabers are not going well. Using regular food coloring to dye the candy melts make them seize up. (I should have known that.) Making a trip to Wal*Mart to get concentrated dye won’t matter, because it is water-based and will also make it seize up. (Should have checked the label.) I went with sprinkles. The problem is I have to use blue and green (because light sabers can’t be pink) and they can’t be crossed because that would be canonically wrong. Plus, they look like clubs. I have given up for the night. They are in the freezer until I can look at them again. Maybe the marshmallow stormtrooper toppers are the way to go. Maybe dip them in colored frosting? Maybe that’s not what you’re going for. It’s been emotionally draining here with Dennis’s funeral and all, didn’t know about Nancy, we will be praying for her, maybe even glove up and go for a visit! I knew she looked drained. Oh I can’t wait to hear & see the rest of this story! 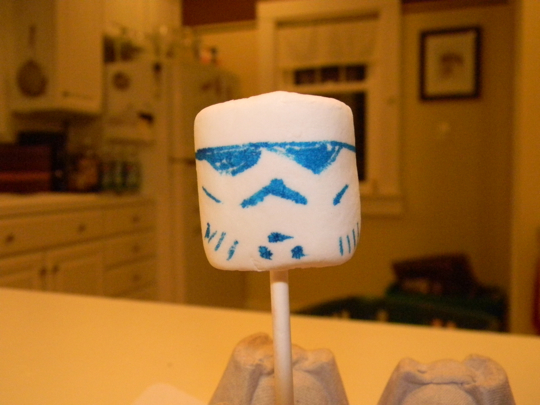 I LOVE the marshmallow stormtrooper. I’m guessing you’re making treats for Tim??? What fun! Prayers for you mom….praying right now. Michelle sent me the news on your mom. She’s soo secretive or I should very private. Called her immediately. She had two nurses buzzing around her and couldn’t talk. Said she would call me back. Thankfully she sounded good.